Accessing appropriate transport is a challenge felt widely in the disability community despite it being key to providing people with the freedom to build an independent and inclusive life. While car share services continue to grow, people living with a disability are limited to taxis equipped for wheelchairs, some public transport or specialist vehicles that are a huge expense for the average family. So where does the disabled community fit into this rapidly growing car share industry? 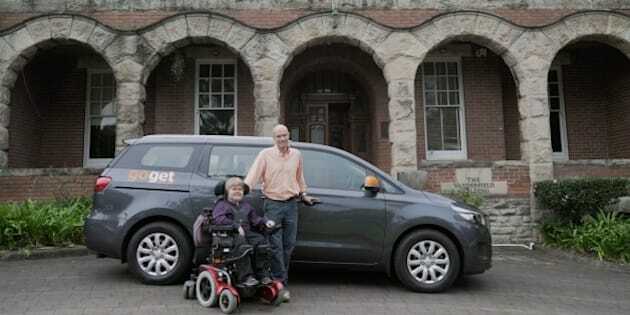 It’s a question Peter Hojgaard-Olsen and his son, Philip who lives with muscular dystrophy have been asking for some time, ultimately driving them to reach out to car sharing service GoGet, proposing they expand their fleet of vehicles to include a wheelchair-friendly option. “By the time Philip was 12 he needed to get a wheelchair. Obviously, being in the disability environment we quickly realised that lots of people had compromised their ability to make money by caring for their family members -- which makes it very difficult to afford transport,” Peter Hojgaard-Olsen told The Huffington Post Australia. Fast-forward 18 months and GoGet took its first step in creating a more inclusive offering by launching a world first fully accessible car sharing vehicle as part of a healthcare network on Tuesday. Launched at Sydney’s Royal North Shore Hospital, the eight-seater Kia Carnival has a hydraulic floor and is equipped to accommodate a wide range of wheelchairs. The pilot vehicle will initially be based at the hospital, enabling family members and carers to utilise the vehicle to and from doctor’s appointments, with plans to roll out the model nationally should it prove successful, starting with 20 cars in Sydney. Philip lives with muscular dystrophy and needed a wheelchair from 12-years-old. Hojgaard-Olsen said the service will not only provide people with a disability more freedom, but it will address a desperate need of improving access to healthcare. “With muscular dystrophy, you end up being a regular at the hospital. Getting back and forth to appointments without transport becomes a huge task,” Hojgaard-Olsen said. Tristan Sender, CEO of GoGet carshare said the initiative fits with the company’s ultimate mission of providing people and organisations with an alternative to owning expensive assets. “These vehicles in particular are even more expensive than regular vehicles, by sharing them we should be able to help people with disabilities cut their costs and increase their freedom,” Sender told HuffPost Australia. As far as cost goes, Sender said keeping the service affordable is a priority. “We have different levels of costs for cars, right now we’re looking at the second tier price from $8.35 per hour,” Sender said. GoGet have the support of non-government organisation Spinal Cord Injuries Australia who work to ensure people with a disability can lead independent lives. Philip's father, Peter said the service will enable carers to assist with transport to hospital and healthcare appointments. “Difficulty in accessing appropriate transportation can be a real barrier to independence and can be very isolating. This vehicle will help to open up people’s worlds and allow them to do things others take for granted -- such as a day trip with their family,” Peter Perry, CEO of SCIA said in a statement. Hojgaard-Olsen said the response has been overwhelming, especially for those with spinal cord injuries who have had to respond to an instant and sudden change of circumstances. But the underlying message at hand, as Hojgaard-Olsen highlights, is the need for more awareness around disability. “This is the sort of thing [car sharing] that’s required to ensure a more cost-effective society. People should be able to get from A to B and by offering people integration it actually makes it possible for people with a disability to participate and contribute in society,” Hojgaard-Olsen said.